The West Bloomfield Township Public Library has knowledgeable youth librarians, early childhood specialists, materials, programs and other resources to help children grow up reading. Use the strategies and tips in this guide throughout the school year to increase your second grader's reading comprehension and reading enjoyment. Why reading with your second grader is so important In first grade, your child learned strategies for reading unfamiliar words and began to read more challenging books. In second grade, as your child's reading skills improve, the emphasis is on comprehension and understanding what is happening in a story. Second graders read books with more complex vocabulary and plots. They read books with more sophisticated ideas, views of the world and reasoning that may need explanation or clarification. 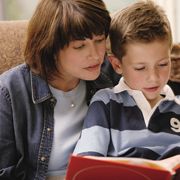 Read with your child and talk about what you're reading. This dialogue fosters a greater understanding of concepts, circumstances and dilemmas that your child may not fully grasp if he is reading on his own. Talking together will increase your child's reading comprehension and help prepare her to handle personal and social situations in ways you want to encourage.